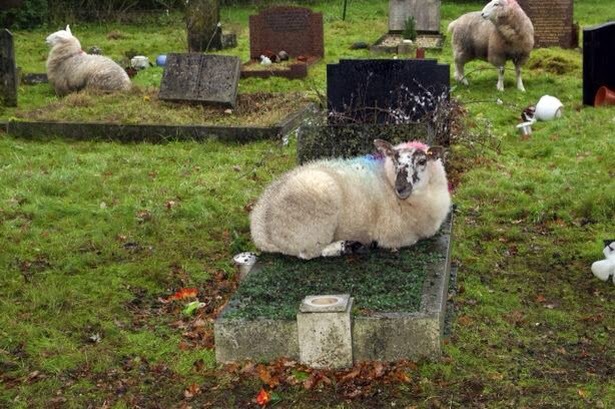 Without much of a budget for maintenance, leaders at Holy Trinity Church in Grazeley, Berkshire, U.K., are using the historical and ecologically sound method of allowing sheep to graze in the graveyard to keep the grass at a reasonable length. They put up a sign advising visitors to keep their dogs on leashes and notifying them that flowers left at the graves might be eaten by the sheep. The animals are, however, accused of doing much more: stampeding, damaging headstones, trampling plots, chewing on pots and baskets, and leaving their droppings everywhere (SLIDESHOW HERE). But their mere presence is disturbing to some. Nicola Millard came to visit the graves of her grandparents and laments, "...I arrived to see four of them stood on my nan’s grave. I was so heartbroken.” Personally, I would be much more disturbed if the graveyard was overrun with badgers. I'm such an animal lover, I would love having animals "nest" on my grave!